The housing was made mostly from wood and sustainable materials. None tree was cut on the parcel, what had been a challenge because the forest is very bushy. 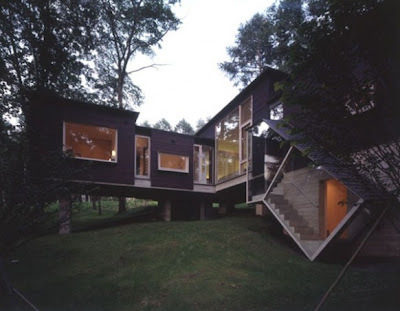 The architect wanted to point out that it is possible to built a modern housing in the heart of a forest without any human intervent. 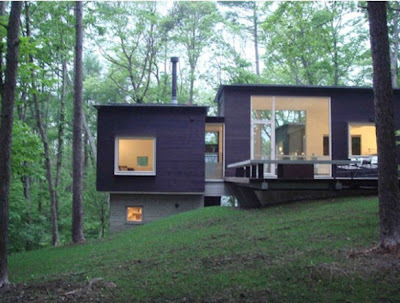 As for the interior, it is minimalistic and simple allowing to perceive the presence of the forest. Owners of the house can economize a lot of electricity thanks to the sustainable materials and natural shading of trees. The majority of the present population is concentrated in big cities. This tiny house constructed in the middle of a forest has been designed by Mutsue Hayakusa that specializes in green architecture design and creation of “cell spaces” that are functional as well as efficient. The interesting facts about this projects are its location in the houseless area and its concept based on a game with geometric shapes.